The Sabres missed out on another number one center when Jeff Carter was shipped to Los Angeles last night. However, Buffalo not jumping into the Carter sweepstakes isn’t as upsetting as missing out on a player like Brad Richards. 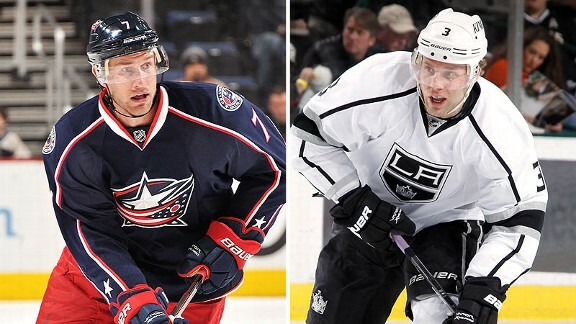 Los Angeles sent defenseman Jack Johnson and a conditional first-round pick to Columbus in exchange for the disgruntled center. Plenty of people in Sabres nation are likely wondering why Darcy Regier failed to acquire Carter. I say, who cares? The most obvious issue regarding Carter’s trade is the fact that he is moving on to his third team in less than a year. There were the reports of locker room issues in Philly, there was the Dry Island debacle and now it seems his cancer spread to the locker room in Columbus as well. Additional reports of being less than pleased with his move to Ohio’s capital were floating around as well. How many of these reports are true? There is no way to be sure. But if even half of that information is true, placing him in “the worst city in the NHL” probably wouldn’t do much to pick up his spirits. Episode number three of The Instigator takes a look at where the Sabres may be heading as they work towards the trade deadline. This episode also introduces fan Twitter questions in addition to a new segment called “Plus/Minus”. As always, comments and criticism are welcome and encouraged. You can find me at @2ITB_Buffalo and Eric at @3rdmanin. Don’t forget to check out Eric’s work on 3rd Man In as well.